With the OnePlus 5T now officially discontinued in North America, attention turns to its successor, the OnePlus 6. The company that positions its devices as flagship killers typically offer high-end specs at a relatively affordable price. To give us a glimpse into what OnePlus has in store for its next device, @evleaks has taken to Twitter showcasing the latest leak. Evan Blass is notorious for being incredibly reliable and accurate when it comes to pre-release leaks of smartphones. This time he posted an image of the OnePlus 6 rear that gives quite a bit to discuss. You’ll notice that the OnePlus 6 retains the 3.5mm headphone jack, which is something many OEMs have been ditching in favor of USB-C or Bluetooth audio. In the new image, the rear of the device looks to have a wood grain style, similar to what Motorola used to offer through Moto Maker. It doesn’t appear to be removable, so it could be a different approach than what OnePlus has done with StyleSwap covers in the past. The fingerprint sensor is placed on the rear of the device to match the direction that many recent Android devices have taken. It also seems the dual-camera found on the 5T is retained for the OnePlus 6, no doubt with some under-the-hood performance improvements. 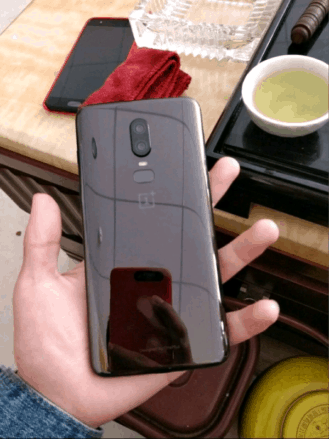 The design details align with previous leaks that show the OnePlus 6 with a glossy back. This suggests the device will be offered with different rear-material options that depart somewhat from the traditional color options. 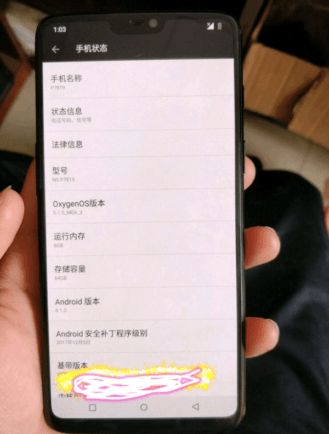 A further leak revealed the front of the device, which suggests OnePlus has adopted a notch design. That will likely provoke mixed opinions with some mild outrage. There’s no indication of a launch date just yet, but with the 5T no longer on sale, we should expect to see the OnePlus 6 in the next 2-3 months. This would also tie in with previous device release dates from the company.